Surrey county close to London and Heathrow and Gatwick airports also has easy access to major arterial road routes (including the M25, M3 and M23) and frequent rail services into Central London. 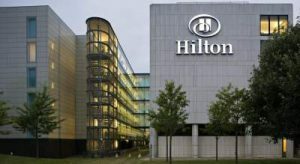 The colourful rooms at Holiday Inn Express London – Epsom Downs each have a flat-screen Freeview TV and a work desk. All rooms have air conditioning and a bathroom with a power shower. A generous breakfast buffet is served daily, featuring traditional cooked items. The Great Room serves a varied menu and range of beverages, and features a relaxing lounge space. 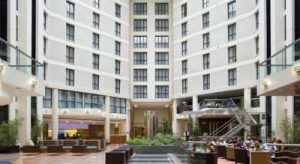 Holiday Inn Express London Epsom Downs is just a 10-minute drive from Chessington World of Adventures. Central London is a short train-ride away, and Wimbledon is a 20-minute drive. 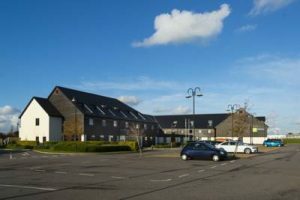 The rail station is nearby and the town centre and shops are a 3-minute walk away. Twickenham is only 20 minutes’ drive away. All rooms offer a 32-inch flat-screen TV, an en-suite bathroom, and a minibar. Some rooms enjoy scenic river views, and each room features a telephone and tea/coffee facilities. Mercure London Staines-upon-Thames has a terrace bar and restaurant, with panoramic river views. Guests have discounted access to a local leisure centre, with use of a gym and pool. 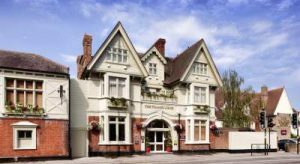 Amongst nearby attractions, guests can reach Thorpe Park, which is 10 minutes’ drive away, Windsor and Legoland, both 11.3 km away. Significant landscapes in Surrey include Box Hill just north of Dorking the Devil’s Punch Bowl at Hindhead; Frensham Common, heathland with a variety of plant, animal and birdlife plus the Great Pond and Little Pond dating from the Middle Ages when they were constructed to provide food for the Bishop of Winchester’s estate. Leith Hill to the south west of Dorking is the highest point in south-east England. Witley Common, Thursley Common and Elstead Moat are expansive areas of ancient heathland south of Godalming are run by the National Trust and Ministry of Defence. 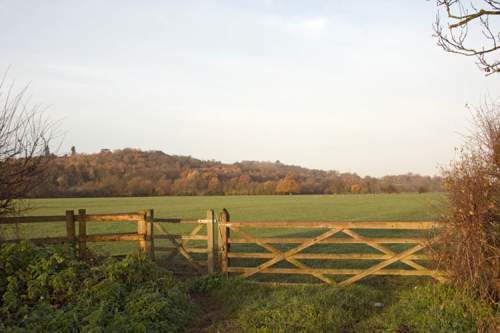 The Surrey Hills are an area of outstanding natural beauty (AONB). More manicured landscapes can be seen at Claremont Landscape Garden, south of Esher (dating from 1715). There is also Winkworth Arboretum south east of Godalming which was created in the 20th century. 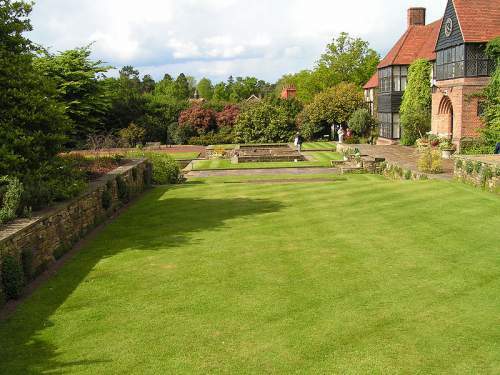 Wisley is home to the Royal Horticultural Society gardens. Surrey has important country houses such as Clandon Park, an 18th century Palladian mansion in West Clandon to the east of Guildford. Nearby there is Hatchlands Park in East Clandon, east of Guildford, was built in 1758 with Robert Adam interiors and a collection of keyboard instruments. Polesden Lacey south of Great Bookham is a regency villa with extensive grounds. On a smaller scale, Oakhurst Cottage in Hambledon near Godalming is a restored 16th century worker’s home. There is a museum at Rural Life Centre, Tilford. The county is linked to the sea by the River Wey and the Wey and Godalming Navigations. Dapdune Wharf in Guildford commemorates this and is home to a restored Wey barge, the Reliance. Furthermore on the River Tillingbourne, Shalford Mill is an 18th century water-mill. There are many typical English villages including Holmbury St Mary which lies in an Area of Outstanding Natural Beauty, close to the Greensand Way and North Downs Way in Surrey. It was developed in the 19th century and still has a mainly Victorian character as on the whole no new building is allowed. The youth hostel, constructed in the village in 1935, was the first purpose-built by the Youth Hostels Association. Runnymede at Egham Surrey is the site of the signing of the Magna Carta in 1215. Waverley and Chertsey Abbeys were very significant in medieval Surrey. Brooklands Museum recognises the motoring past of Surrey. The county is also home to Thorpe Park, & Chessington World of Adventures, sister theme parks of Alton Towers. Take A Break Holidays takeabreakholidays, Surrey Accommodation.